Session players will play on a lot of crap. It’s part of the job. You’re hired, you go in and play the songs to the best of your ability, you accumulate credits and you get more work. The quality of the material you play on is almost irrelevant. Unless you’re at the very top of the A list, you can’t afford to turn anyone down, and folks who are at the very top of the A list, well, they didn’t get there by turning down opportunities. If there’s a player on the session you’ve never hung with, or a producer who you’d like to connect with in future, who cares if this particular song is a no-hoper? This is a career, after all. You have to play the long game. If you want to understand the session player mentality, consider Matt Chamberlain, once the drummer in Edie Brickell’s New Bohemians, who was asked to do a tour with Pearl Jam in 1992, just when they were blowing up. The tour went well enough that he was offered the slot permanently (yeah, Pearl Jam weren’t Mudhoney; being a former New Bohemian didn’t disqualify you). Yet Chamberlain turned it down to play in the Saturday Night Live band. He was 25 years old. Call me an unreconstructed punk rocker if you will, but being in the SNL band should be no 25-year-old’s dream gig. In any generation, only the most technically gifted players get to make that choice. Only the very few can make a living as a recording drummer, particularly since the advent of drum machines and drum programming software. Rock fans tend to lionise favourite players in favourite bands, but usually these guys would be the first to admit that they’re stylists, not technicians. 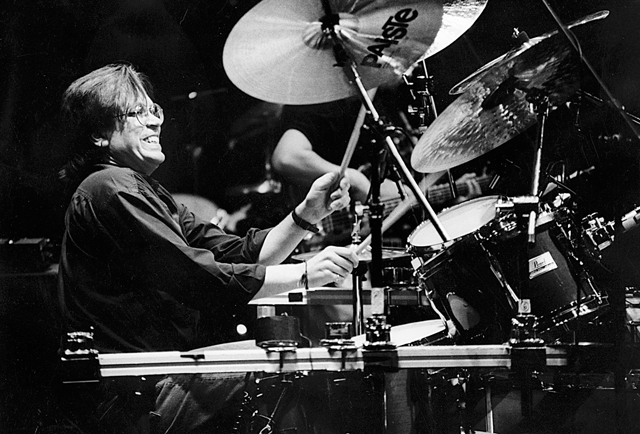 If you want to know who the best drummers of this generation are, ask some record producers. Look at the credits for recent big-budget singer-songwriter albums: you’ll see people like Chamberlain, Joey Waronker and Jay Bellerose. Once upon a time, you’d have seen Jeff Porcaro. Porcaro’s credit list is a fascinating read. Reading down the list, you see him muscle his way to the very centre of the LA-based rock-soul interface in the mid-1970s when barely in his twenties by playing the hell out of some fiendish Steely Dan charts and grooving like a mother through Boz Scaggs’ Silk Degrees. His performance on Lido Shuffle is a favourite of mine. It’s an all-time-great drum track. It’s as tight as can be, yet it feels ridiculously good. There’s a half-hour instructional video of Porcaro’s on YouTube (and watching it gives you an insight into why he was so continuously employed; he put a lot of care into his bass drum patterns and his approach to both to choice of hi-hat pattern and employment of dynamics within that pattern is eye opening). He picks apart his Lido Shuffle groove for the benefit of dullards like me. On the hat he plays the first and last note of the triplet on each beat of the bar, while the second note of the triplet is played as a ghost on the snare. He plays the backbeats (two and four) on the snare. On the kick, he plays first and last note of the triplet on the first beat and the last note of triplet on the second beat, repeating that pattern for the third and fourth beats. It’s intricate, for sure, but it makes a lot of sense when he plays it. And his ability to jump in and out of it – to play his fills at the end of each verse, just before the line ‘One for the road’ – is really impressive. This guy, clearly, was a hell of a player. Yeah, he was a member of Toto. So what? He played on Bad Sneakers and Lido Shuffle. Yet getting an overview of his career by reading his credit list is overall a dispiriting exercise. As you get further down the list into the late 1980s, the artists who employed him get ever more washed-up and irrelevant, further and further from anything you could defend artistically. I’m sure he got paid a shedload for playing on Michael Bolton’s Time, Love & Tenderness and Richard Marx’s Rush Street in the early 1990s, and sure, he was at an age where Pearl Jam wouldn’t have been calling him up to occupy the drum stool anyway, but there were genuine artists working in the major label system too, and to actively choose Bolton and Marx seems such a waste, given how abruptly his life would end in 1992, when he had an allergic reaction to pesticides he’d used in his garden. If you’d like to hear some of my recent work, here you go! This entry was posted in Music and tagged Bad Sneakers, Boz Scaggs, Colonel Jeffrey Pumpernickel, Edie Brickell & the New Bohemians, hi hat, Jay Bellerose, Joey Waronker, Katy Lied, kick drum, kick drums, LA, Lido Shuffle, Love & Tenderness, Matt Chamberlain, Michael Bolton, Mudhoney, Pearl Jam, recording industry, Richard Marx, Rush Street, Saturday Night Live, Session players, shuffle, Silk Degrees, Steely Dan, Time, Toto, triplet groove, triplets, underrated drum tracks, youtube on September 21, 2014 by rossjpalmer.